2. Add sugar and vinegar. 3. Stir well until sugar is fully dissolved. 4. Add the beetroot slices and stir gently. 5. Remove and keep aside for 15 to 20 minutes. 6. Drain the water well. 8. Fry the sliced beetroots for a minute or until crisp and golden. 10. Transfer to a container. 11. Sprinkle salt and pepper powder. 12. Cover with a lid and shake well. 13. Serve as a snack. 14. If stored in a sealed container, these stay good for 3 to 5 days. For a healthier version follow steps 1 to 6 from above. 7. Place the beetroot slices in a flat baking tray lined with parchment paper. 8. Sprinkle salt and pepper powder on top. 9. Bake in a preheated oven at 125C/250F for 20 minutes r until fully dry. 10. Remove, cool and store in a sealed container. 11. Serve as a snack. 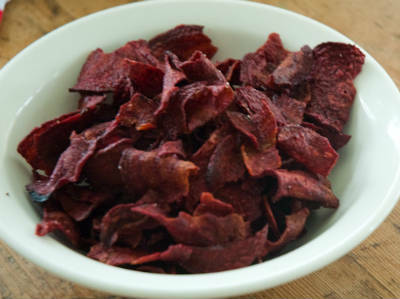 Feel free to comment or share your thoughts on this Beetroot Chips Recipe from Awesome Cuisine.